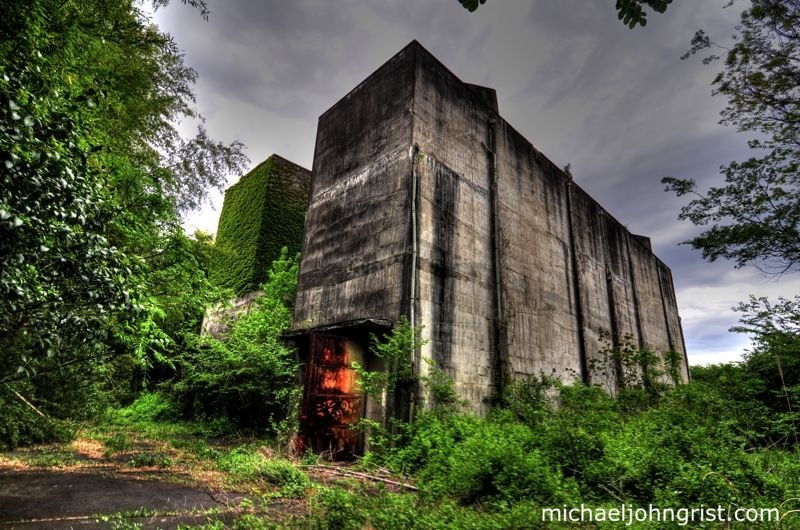 The abandoned US Air Force (USAF) base in Tachikawa is a bramble-choked memento from the early days of Japanese/American war and peace. It was annexed by the USA shortly after World War II, in co-operation with the still-active nearby Japan Army (SDF) Base, then abandoned in the 1970’s as the Vietnam war came to a close. Its three huge chimneys are still visible from the exterior, brick-red and lined up like masts on a rudderless ship, slowly sinking deeper into the smothering sea of green jungle. 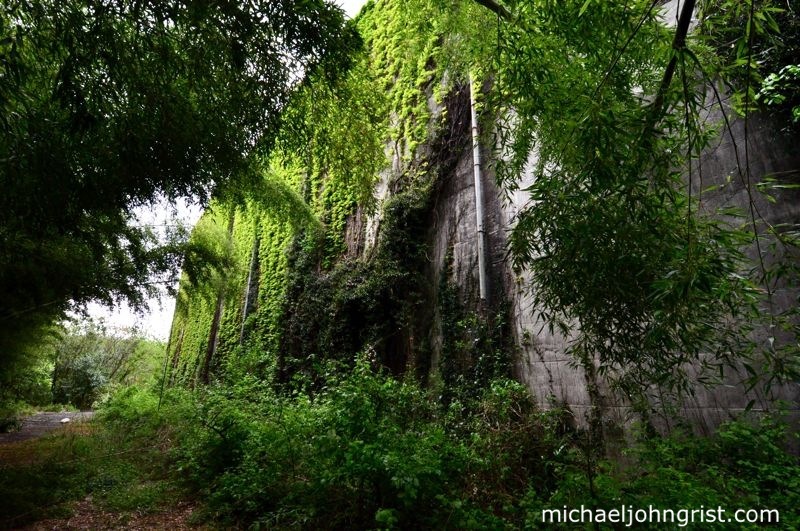 Its airstrip now swims with weeds, and bamboo forests have grown through the foundations where buildings once stood, patrolled by old men on bicycles keeping a watchful eye on the 10-foot perimeter fence. Storage bunker, one of the few remaining structures on base. As with the Fuchu Air Base, I’ve been here before. The first time was some two years ago, in the early days of my haikyo exploration. I must have walked the perimeter circle 4 or 5 times, as dusk fell around me, wondering if I had the chutzpah to scale the fence. At no point was it easy to climb, and at no point in an isolated spot. It got dark, and I became antsy. The guard in the guard box out front didn’t leave, except to occasionally drive carefully around the interior, or cycle around the fence. In the end, I gave up. It didn’t seem worth it, so I backed off. Map of the whole base. 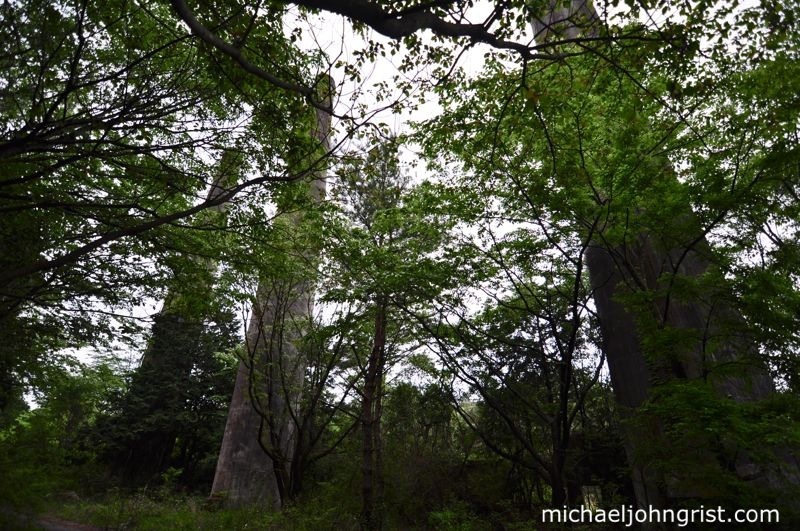 The central part is now the huge Showa Kinen Park, site of Tokyo`s only full disc golf course. The left oblong, 1km long, is the abandoned base. The right oblong is the still-active SDF base. The second time, around a year later, I arrived with my chutzpah turned on, knowing what to expect. After circling the base to my desired sport, I just went at it. Over a fence, and in. After that, my memory’s a series of frantic snapshots as I ran around looking for things to shoot. It started to rain, reducing visibility, and that just amped me up further. Roads criss-crossed in every direction, and I knew that the old security guard could use any of them. I didn’t doubt I could out-run him if it came to a chase- but I didn’t want it to come to a chase. And so even with the sense of real risk pretty absent, I still ran from cover to shelter like a hunted animal. 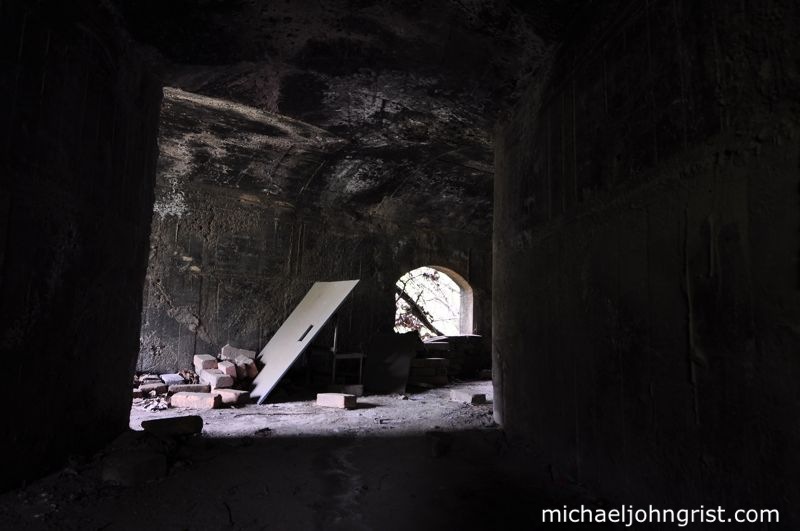 When taking shelter in buildings, I became acutely aware of my heart thumping, and more worried every second about stepping back out of my new-found safety, and into the open. 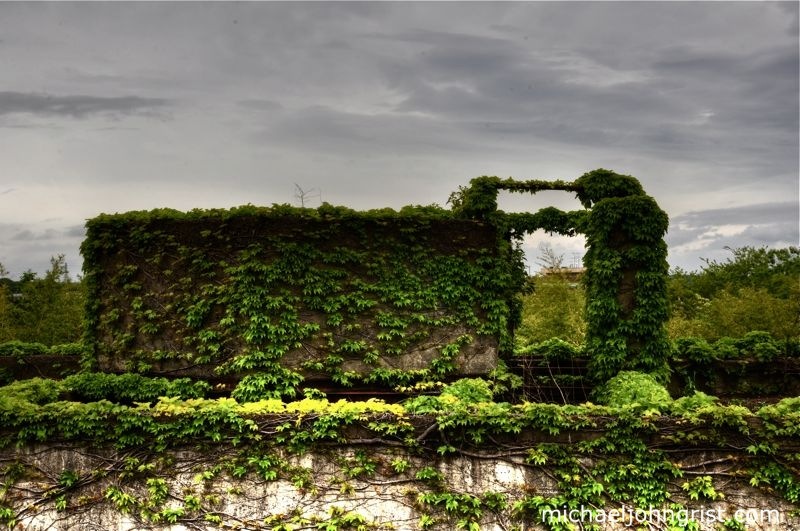 It is pretty huge, covered in ivy, and built to withstand serious punishment. The walls and doors are several feet thick. 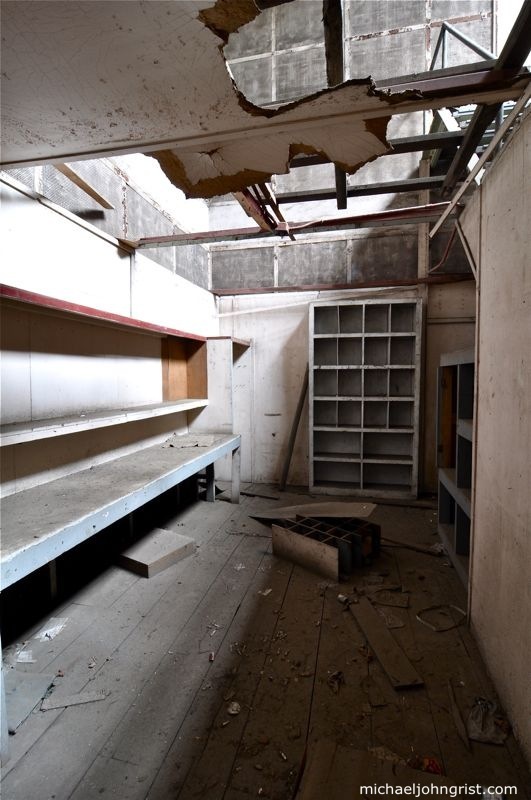 The central part of the bunker had probably once been an office, with desks, machinery controls, and grilled windows looking into the hangar-like storage area alongside. The two doors left and right lead to the hangars. Filing cabinets belie it was an office. The hangars either side were filled with old equipment. 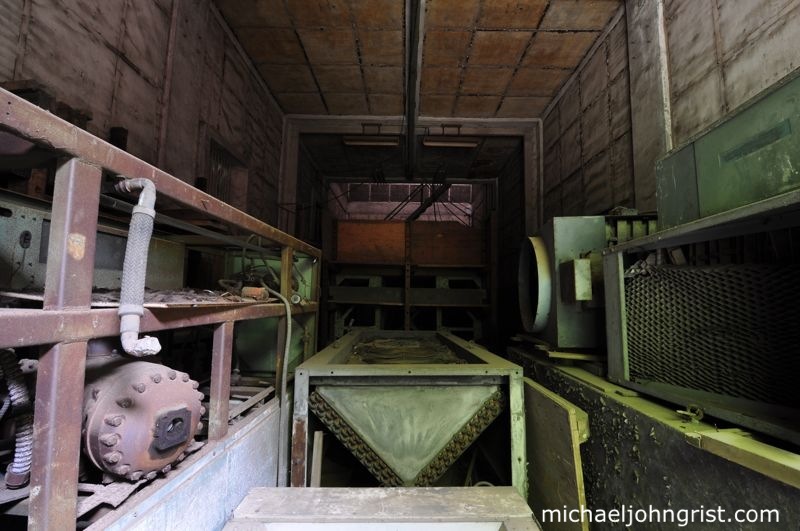 The southern wing (below) had what looks like a lot of air conditioning equipment. The northern wing had chairs and assorted engine parts. 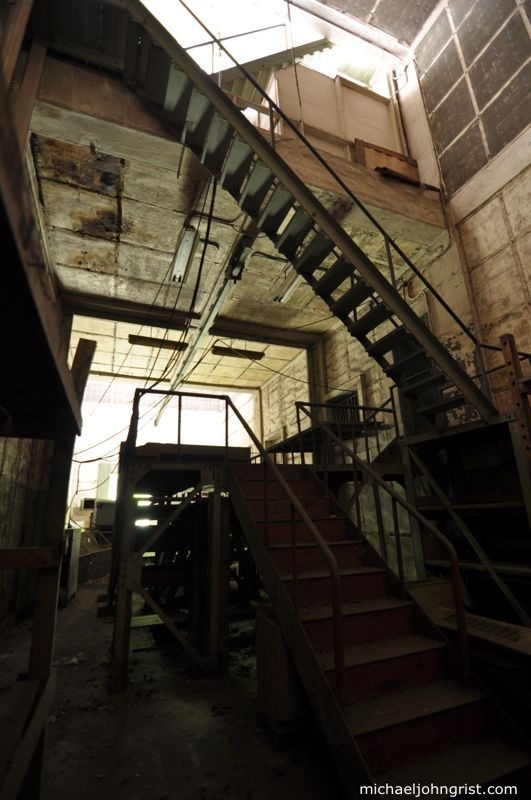 In the back was a staircase, going up to the roof. Of course I clambered over everything to get to it. and up- affording me the best view of the remains of the base anyone’s had in years. Elevator and lift gear in storage. Looking back towards the entrance, the stairs to be climbed. 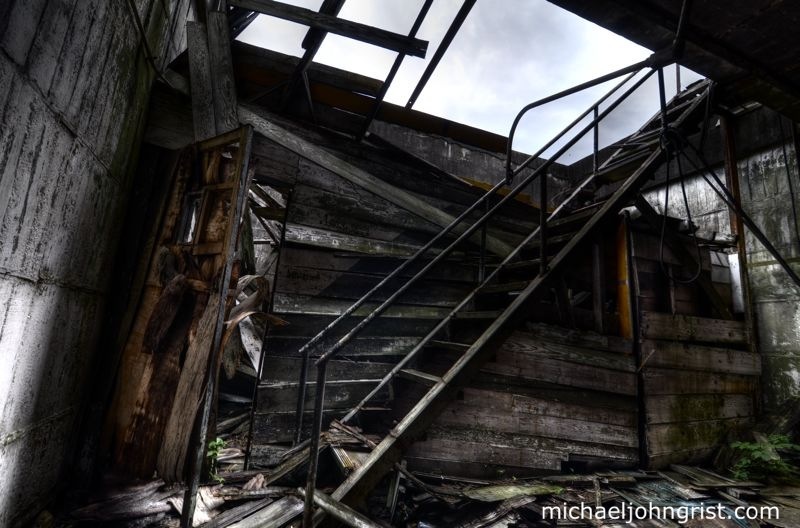 At the top of the stairs was a small room, smashed in rot and weather, then more stairs, then the roof. One of the hazards of haikyo- stairways whose rungs have fallen away. I walked with great care. On the roof the view was excellent, dominated by the forest, and the three chimneys. After leaving that sanctuary, again I was on the run, bobbing in and out of the overgrown forest and through clumps of bamboo, head ducking in search of the old dude on his bicycle. 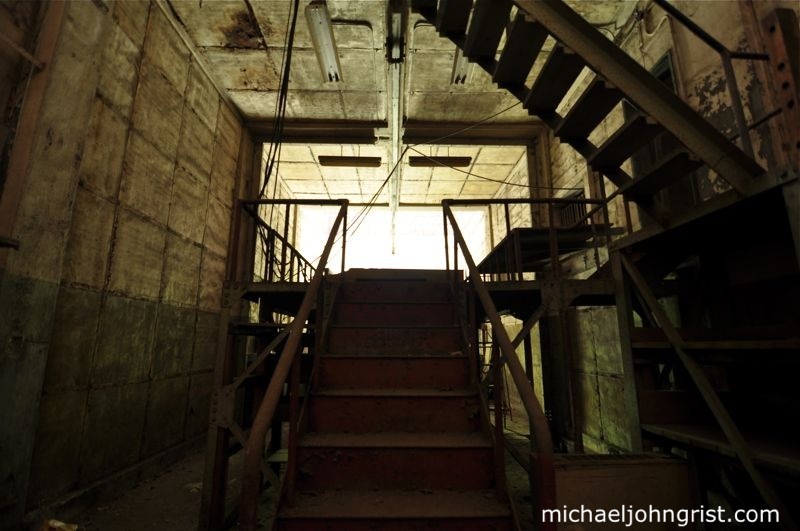 I heard there were immense apocalypse-emergency tunnels underneath the old base, perhaps some kind fall-out shelter for Tokyo’s elite. 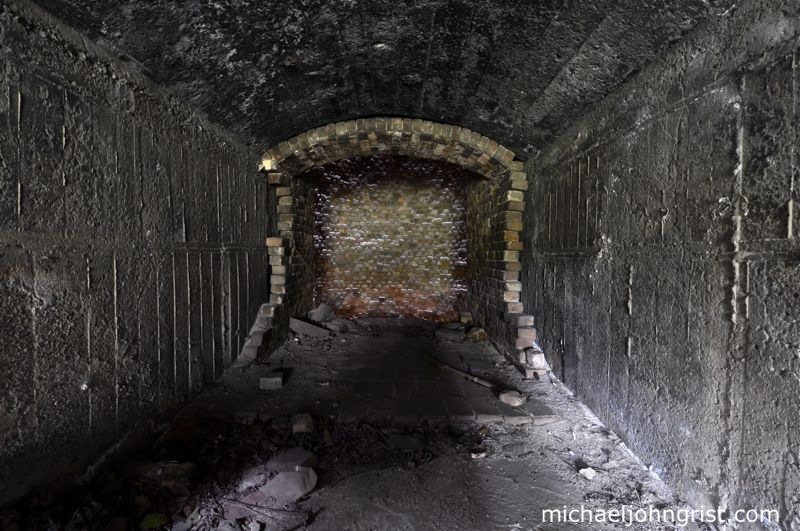 I saw a few hatch-like structures emerging above ground, which had no doors of any kind. Could those be the air circulators, for such a massive complex? 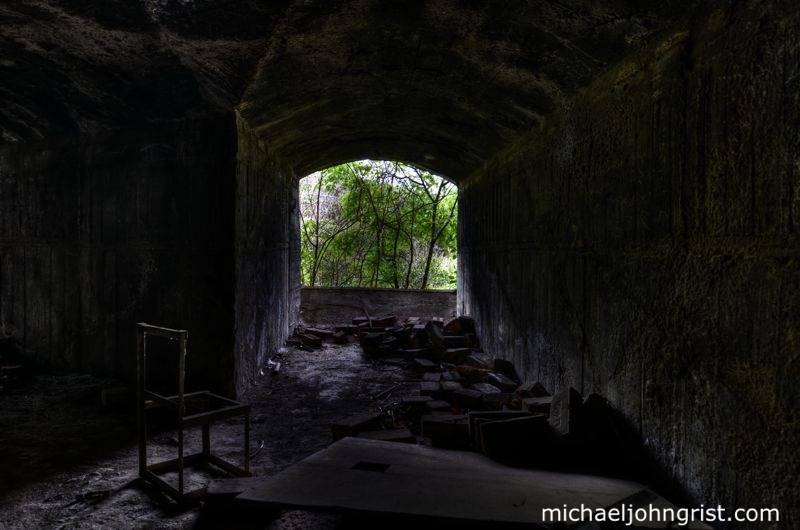 Consolidation resulted in the establishment of the Tachikawa Disaster-Preparedness Base, involving hundreds of miles of tunnels designed to support 5,000 top government members for a year in the event of a catacylsmic disaster. 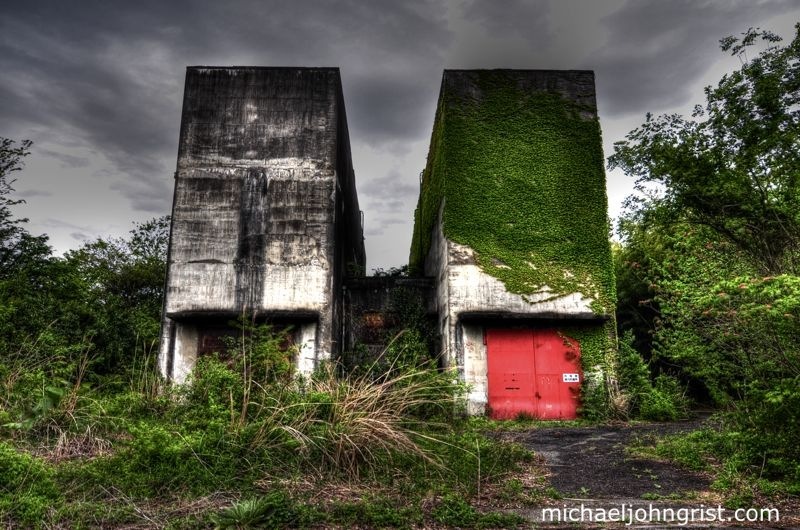 The bunker building is one of only a few remaining structures on the large base lot. I didn’t linger around them. After a while I got pretty turned around inside. Even seeing the three massive chimneys, that I’d seen clearly from outside, didn’t really help orient me. 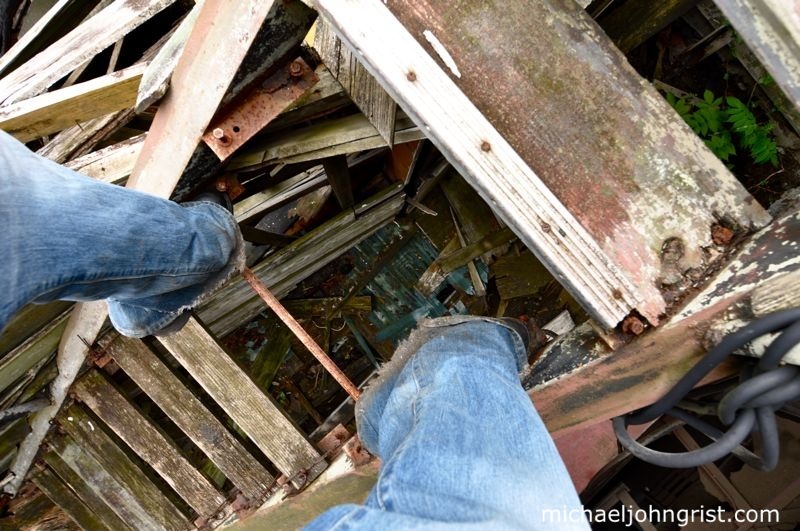 The guards had buckled a ladder into the chimney flues, so it is possible to climb up inside them. I climbed up inside one, and again briefly relaxed. What were these chimneys for, remnants of some kind of power plant, or a waste incinerator? Did they cremate bodies here? 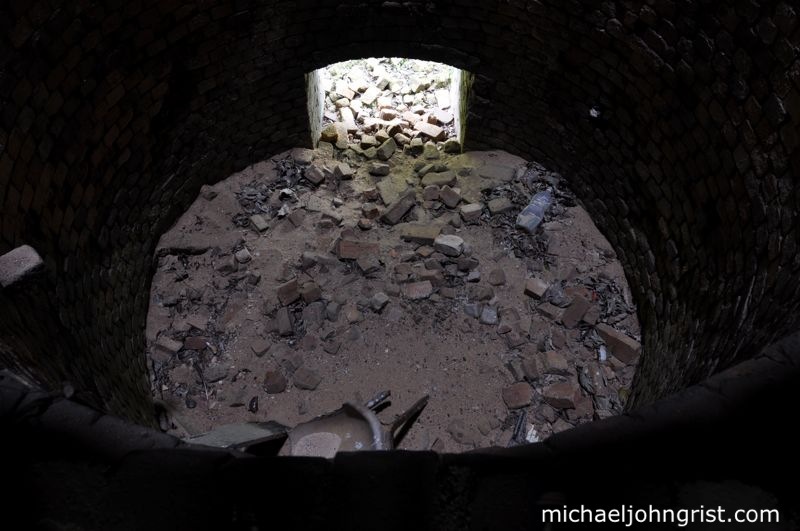 Looking at the inside of the base of the chimney. 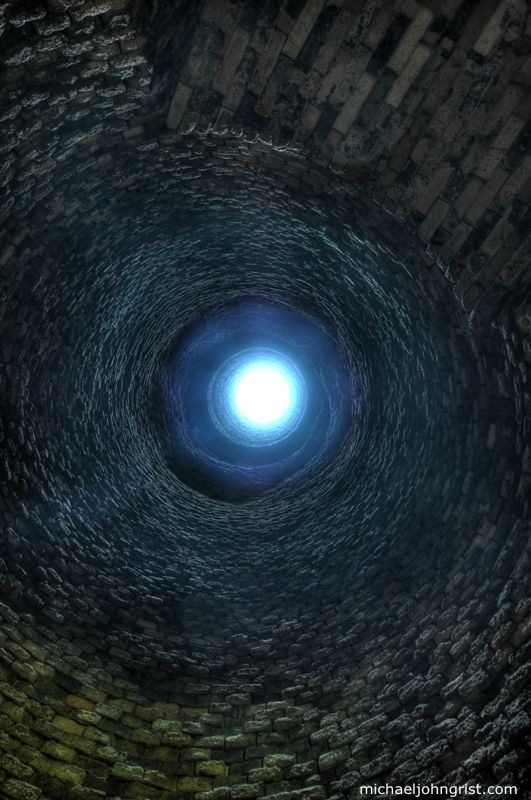 Looking down at the base of the chimney. After the towers, dusk was falling and I really thought I was pushing my luck to stay any longer. I wasn’t sure any more which way I’d come or which way was out- all the straight grid streets of the base looked equally overgrown, and I’d zig-zagged through so much bamboo I had no idea where my entry climbing fence had been. I got out my iPhone and pulled up the map feature. Then, working myself up into a lather, I started to run. Which way was I going? Where was the exit? Watching the little screen with me inching down an overgrown road, peeking up to check I wasn’t slaloming into some obstacle, I felt weirdly like a World of Warcraft character running to his next battle. I ran in a straight line for a few minutes, until at last one of the easiest fences- also closest to the guard’s box- emerged, and I plunged for it. At last I hit it, vaulted over the top, and landed on the legal side, out of breath. An old lady looked at me confusedly. I nodded, and went on my way. So it goes. The Tachikawa base started life as an Imperial Japanese Army airfield, though that role later morphed to also cater to civilians by the 1920’s. In 1929 Japan`s first regularly scheduled commercial air service departed from this base to Osaka, a three hour commute that was in operation for 4 years, until the service was moved to Haneda airport on Tokyo Bay. After 1933 the base returned to being an Army airfield, and remained so until the end of World War II. During the war it was defended by the Shintentai, an anti-aircraft kamikaze group. Near the end of the war Tachikawa was subjected to heavy bombing, and in the aftermath was occupied by the US. From Wikipedia– Disaster struck Tachikawa on June 18, 1953 when a U.S. Air Force C-124 Globemaster II transport experienced an engine failure on takeoff, crashing shortly after. The accident claimed the lives of 129 people, and was the deadliest air disaster in history at the time. With a runway only 1,500m long, Tachikawa was not adequate for the largest aircraft, and the U.S. decided to extend the runway into the neighboring town of Sunagawa. The July 8, 1957 Sunagawa Riots resulted in cancellation of the plan. 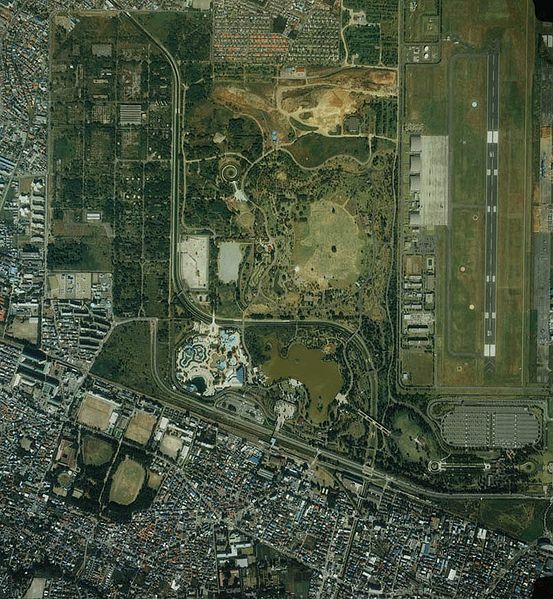 The U.S. instead developed Tama Airfield (the present-day Yokota Air Base) and moved its operations there. By 1969, the U.S. had largely left Tachikawa, and in 1977, after the end of the Vietnam War, it returned the base to Japanese control. The Japanese government put the land to a variety of uses. The Japan Ground Self-Defense Force established a base there, as did the Japan Coast Guard, the Tokyo Metropolitan Police Department and the Tokyo Fire Department. my name isdavid marquis I was at tachi from 55 to 57 iwas in the af in hq sqd I worked indata processing I amlooking foor a girl namedsatachicoho worked in data processing does anyone know of her ???…. When I was about 4 yoa, my Father, Norman Martin was a civilian assigned to a logistics group of sort tracking aircraft parts in the region. My sister Debbie was born there in 1957 Could you have possibly met him? I was born at the Tachikawa Hospital in 1971. My younger sister was born there in 1973. My Dad was stationed there – he was a CDR – Naval Aviator. I plan to go back in 2020 for the Olympic games…can’t wait! Arrived at Tachikawa Jan 1958 tell Jan 1960. In supply with 6 troop carries sq. loved my tour in Japan. My family arrived Tokorozawa army depot in September of 1961. My dad was in Civil Service working for the Army as a Supply Maintenance manager. We lived there for about a month (going to Johnson Junior High) before we moved into our home at 305 American Village next to Tachikawa AB. I transferred to Tachikawa JH and went onto graduate in 1967 from Yamato HS. So many great memories of growing up as a teenager in Japan during the 60s!! I was born in Tachikawa in 58, my Dad had a pic of me climbing the water tower in 61. He always said I was 80 feet up, but looking at the photo I was only about ten feet off the ground. Was anybody there for that? We arrived in Tachikawa in 1958 and my sister was born at the hospital on the Tachikawa Air Base in 1959 in November. We left Japan in March of 1960. My sister has always wanted to go back and see where she was born so we are planning a trip in March 2019. I was 8 when we arrived in Japan and 10 when we left. I was in 3rd grade and went to the 4th grade at the elementary school for military dependents on the Air Base. We possibly could have gone to school together? I was born at the air base hospital in March of 1960.Left there in ’63.My wife and i are planning a trip there within the two years. Michael, I was born in 1964 and lived at W-21 West Tachi Court, Akishima-shi, Nakagamicho, right near the Laundry gate. A friend found the map as it looks today and I have no idea if our street was nearest the main road or one little street back from the main road. Do you happen to know if the street was renamed since the ’70s? Kinda desperate to find out. I lived in Tachi West Court (W-117 if I remember right) from 1960-65. We loved it and my dad extended his tour twice. I wonder if the old base movie theater is still standing. It was converted from a Japanese wind tunnel for research. I remember it as huge, tho I was pretty small at the time. I was considered a ” war baby”. I was born in 1949 to a single Japanese lady. My real Dad left her & returned to the States. She put me up for adoption and I was placed in Ms. Sawada’s orphanage right outside the base so she would not “lose face” with her family. I was adopted by a military family while they were stationed at Tachikawa. My adoptive Dad was a T/ Sgt with the 6100 Support Squadron, if I’m not mistaken. I remember when my he would drive from the Eastside of the base to the Westside. I thought it was fun, like an amusement ride. I also remember the huge moose statue located in front of the NCO Club. I was so afraid of the statue because it was huge & it was threatening. Even though I was young I have this memories.? lived down the street named Utomison I loved like my on brother. Precious memories!!! fast pitch softball and coached. Would love to stay in touch with anyone from that time. My dad was stationed at Yokota, but I was born at Johnson October 1960 (Yokota didn’t have a hospital). We also had a Japanese housekeeper. Her name was Torschko(?). Who, according to my mama, carried me on her hip in a sling made from a cloth diaper while she went about her daily routine at our house. In the winter Torschko would describe how cold it was by counting the number of sweaters she wore, “it’s 3 sweaters or 4 sweaters”. I was only two when we left Japan and have no memories only feelings. But I do remember as I got older my relatives would tell me that I spoke broken English and fluent Japanese (the 2 year old version) when we got back to the states. I remember my mama talking about “if you wanted to go to a nice BX you went to Tachikawa”. I really need to start writing this down before I forget and my mama is gone. My dad was the Manager of that “nice BX” at Tachi from 59 through the very end of 66. I was six months old when e went. Our housekeeper was Kiko and her daughter was the same age and they lived in our home. My mom was the Revlon rep for the entire Pacific region back then. Being almost 8 when we left, I have many wonderful memories growing up at Tachi Hill Court G. Our next door neighbors were the Yoshidas, an American family actually. We were there for the Tokyo Olympics and when the Beatles’ first performed in Japan. My oldest sister was a junior at Yamato when we left. We have so many pictures and 8mm movies from that time and I have nothing but fond memories for our time there and a great love for the Japanese people who were always so kind to me. I was 8 years old when we arrived in Tachikawa, Japan. We also had a Japanese teenage maid who lived in with us. She taught my brother who was 5 and I how to count in Japanese and a Japanese nursery song. We lived off base in a compound that was called “Green Heights”. I remember the air base sent a bus to the compounds to pick up the military children and take us to the base to school. I would love to hear from you and hear some of your stories from then. I do remember Dad taking my brother and I to the movies on Saturdays as a treat. My father, John Verlin Post, was in the US Army, stationed in Hiajima in 1945-46. In 1946 he was in Tachikowa Hospital for an infection. Is this Hospital still in existence? Wihile in Hiajima he was in charge of construction at a military base. One building was a theater which burned shortly after construction. Is there any information about the US Military role while there? Thank you for a look inside the wall and writing about it. I was born at Tachikowa AFB in 1949 and my parents left the base 2 years later so I have no recollection of it, just a lot of excellent photos of the base quarters, the movie theater, NCO club etc. I’ve never been back to Japan and will go on a cruise there next month. Is there a place that might have some sort of marker that describes the Tachikowa AFB so I can photograph it and put it with the venerables that my parents (departed) left with me? Anyone been back and seen such a marker? 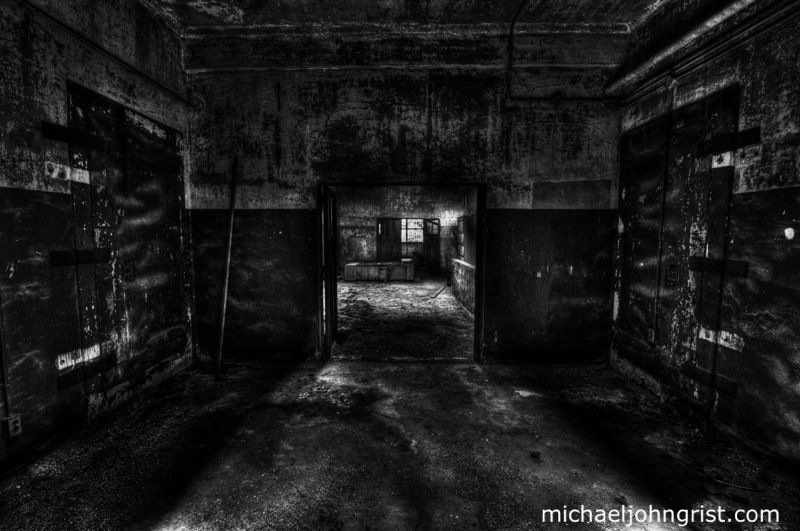 Thanks again, Michael. . .good photos and insight. I wish you could post or share your excellent photos of the base somehow! My father was stationed at Tachikawa – he was with Feamcom – I believe during the time you lived there as an infant. We have looked for good photos of the base online from the time he was there and it’s hard to find them. Would you care to share some with me? My dad is 88 years old and we talk of Japan a lot. I’m trying to convince him to go with me to Japan this May 2019 so we can go find what is left of his base — and also to see relatives. You see, he married a beautiful Japanese woman – my (now departed) mother. My email is colleen.r.deas@gmail if you would care to share any photos of the base directly with me. I was assigned there in 76 77 to close out the Fire Dept equipment..
first duty’s was to assist the 1st Sergeant in getting the Tachi Hospital Barracks up to snuff to turn over to the Japanese Government. I remember we had a working party of 6 or 8 airmen and several civilian emplloyees washing windows, buffing floors ect. Yes we turned over the facility complete with beds, dressers, ect. Also the day rooms had some pretty nice furniture. I remember the soda machines were not left with everything else as they were the property of either MWR or the BX (can’t remember). My family and I also lived at American Village for about six months until we received a Base House (Duplex). I believe we were stationed at Tachi in 65,66&67. I still have the branded hiking stick that my dad got me when we climbed Mt. Fuji. My dad (Col. Justin C Gunnison). flew many missions to Nam and always brought us little gifts upon his return. Dad flew C-124, C-130 and C-133 cargo planes while we were there. It was truly a great experience living there! I would like to visit there and may i know the detail address? Thank you. Was stationed there 1974-1976 stated hospital there moved clinic emergency room yakota in mid 1975 than hospital moved over and I helped set up. Put chairs etc to gather while covering sick call. Vietnam, operation baby lift /operation New Life. I worked in base housing from June 1955 to June 1957. Was responsible for dependent travel to the Tachi area. Loved my tour of duty there. My name is Harold Amidon, I was stationed at Tachikawa in 1956-57. It was an active repair base at that time. I do not remember a squadron being assigned to the base at that time. I had about 25 Japanese mechanics work for me. They were very good repairmen were great at their work assignments. Enjoyed most of my assessment, but worked alone because of my AFSC. Kind of sorry to hear it has been abandoned. Take care and enjoy. My father was stationed in Tachikawa 1955-1958, when I was ages 5-8. He worked in family needs in some way, I think getting families settled. My husband and I are going to visit Tachi this summer. I am wondering if I will recognize anything. I have very little specific info on exactly where we lived other than pretty much on base, don’t know if it was East or West. I was stationed there 1957-1958. Remember the riots in July. I was working with Col Martin & Ltcol Mauck. 2712th Maint Sq Had a good friend Nobutoshi Tanaka staff car driver. Really enjoyed Japan. I arrived at Tachi in October 1945 from Phiillipeanes Via Okinawa. 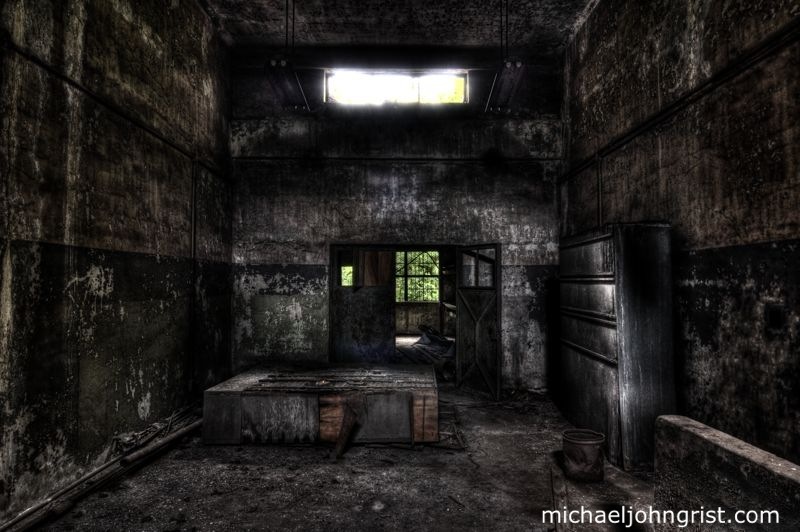 At that time it was a reception center. I then went to Murriyam and then to Irmagawaw AF that was renamed Johnson AF. 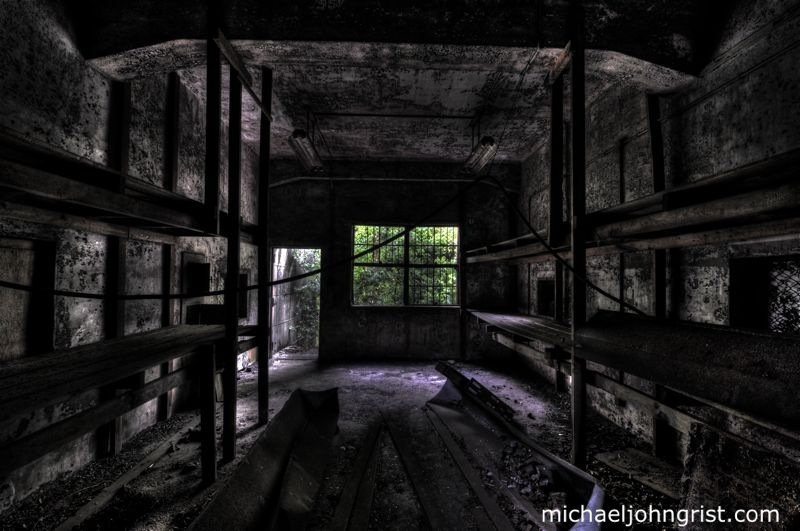 Life was rustic, barracks were old Jjapanese barracks ,no heat ,outside plumbing no PX. I was the only Aircraft electrician on the field. No security and could leave the field without passes. CO was a Major or Col. Crabb. The field upon arrival had grass runway for P5i.P38, B25,B17 ,C47,C63 and small recons. Later ,when field became Johnson AF. put in a concrete runway and a Tower. I had to climb onto thr roof and install a rotating spotlight. If you should get this message and have questions about the time I was there, please contact me at eagdad@aol.com. I live in New Jersey and am 92. Best wishes and thanks for the memory. Ed. My family lived there temporarily in 1973 after leaving Grand Heights awaiting housing at Yokota. Fathers name is William ‘Andy’ Anderson. I was 11 years old then. I still have vivid memories including that big moose in front of the NCO club (restaurant). A great experience. We left yokota in August of ‘75. My father was stationed at Tachikawa AFB a year prior to my mother, sister and I joined him there in Tachikawa from 1952-1953. I was 6 years old and my sister, a year younger. We lived in base housing and were there for only a year. As soon as we arrived, I got the German measles. Boy, was I sick. My mom was a “Grey Lady.” She volunteered at the hospital. We did a lot of traveling to see everything that we could. It was a beautiful country. We had a Japanese maid/nanny named Namisan that helped our mother. She told us about her family and said that everyone lived together. Grandparents included. They all took care of each other. Namisan made us some doll clothes that I have actually kept all these years. That was 68 years ago when we lived in Tachikawa. I tried to locate her, years later, but never was able to find her. Our mother would give us enough yen to sit out front of the place where we lived on base to wait for a man who pushed a small wagon selling ice cream. Quite a treat for 5 and 6 year olds. We have many pictures and even some yen from that time. Good memories. Beverly, I moved to Tachikawa with my parents and brother in 1955, when I was about to turn 5, and left when I was almost 8 in 1958, so I was there after you were, but close in time. I have such amazing memories of those days. I also remember having German measles while we were in Japan. Our maid/nanny’s name was Sayokosan, and she was so much a part of our family. Like you, I remember waiting for a small wagon to buy from, but in our case it was to buy popsicles. I have never had any as tasty as those! My husband and I are traveling back to Japan this year, and will visit my old home of Tachikawa, but I am not sure I will be able to find my way around at all. I also grew up at Tachi. We lived off base outside the laundry gate at Tachi Hill Court G. I went to both elementary school (graded 1 to 6) and Jr High (7&8) at Tachi. I am going to visit Japan in a few weeks. Does anyone remember which train line or the train station stop from downtown Tokyo? Can’t wait to match up a new reality with some wonderful memories. I was a first grade teacher at Annex School and Main School for 2 years, from ’62 – ’64. Lived at Civilian Quad housing, across from the Civilian Club. Loved my time in Japan. Anyone remembers Miss Hanson as their first grade teacher, I would love to hear from you. My Dad James Edward Jackson SR. was stationed at Tachikawa and the family came over from 1964-1968. We lived off base in a housing area that had concrete walls around the house with a kerosene heater for heating in the house. I remember going thru a Hurricane when we were living there with the eye passing over and seeing the walls of the storm. We then moved to Kanto Mura. I went to Yamato and Chofu High Schools. I worked at the commissary at Kanto Mura and bagged groceries, that was good money. I enjoyed my time there and recall going to the top of Tokyo Tower with a friend and the view was Awesome. We were there the same time lived off base with concrete walls in Tachi Hill Court G. I went to the Annex school, main elementary school and Jr High at Tachi. My sister went to Yakota HS..Sandra Sailors. I am Sherry Sailors. My dad was the BX manager, Sam Sailors. I loved going horse back riding at Fuginobi (? spelling). I rode Zora and Stupendous.
. I got to take the first bath since I was company, lol. I’m 75 now – where did the time go!!! This is good stuff! I was born in Tachikawa on July 1 1966. My father was in the air force. I may have an opportunity to come to Japan late February through my work, which is very exciting as it is #1 on my bucket list. My birth announcement had a drawing of a baby in a pink diaper and said “Made in Japan”. I have it tattooed on the inside of my right ankle. In addition, my son is a Navy Corpsman and is stationed in Okinawa (the first half of the trip would be there, the 2nd in Yokosuka) so not only would I get to visit Tachikawa, I could also see my son. I had the unique opportunity to be stationed at Tachikawa with the 374th Field Maintenance Squadron from April 1952 to May 1955. I ran the Squadron Supply for a year or so, then I went to Tech Supply then later to production control. For those interested in fictional history I have written and published a story call ‘The Brass Rail’ which is available on Amazon Kindle. The Story is dedicated to all the men and women with whom I served during my years in the Air Force. My uncle, Msgt Frank Marusinski and wife Noella were stationed @ Tachikawa 1958-60 with the Bully Beefs. He lived on base as part of the command structure. His unit adopted an orphanage near the base, I wonder if it could have been Ms. Sawadas orphanage. I will ask him. He is 100 and sharp as a tack, well almost. His papers refer to the 374th Field maint Sqadron, 1502 Air transport Wing and the 540th. I was a first grader in 59-60 but at Tachi from 1959 to 1968. Dad was Sam Sailors, the BX manager. I went to the Annex school by the back yard from 1960 to 1965 then transfered to main elementary school is 1966, to Jr High in 1967 and 1968. I loved Japan and Tachi. Had a hard time adjusting to the US, its riots, etc in the South (transfered to Warner Robins AFB near Macon, Ga). So very different than calm, respectful Japan. All my teachers were fantastic. I actually started college at 16 due to great Tachi schools and it’s teachers. A nice trip down memory lane for an old USAF vet. Stationed at Tachi East from April 1956 to December 1958. I always wanted to take a trip back, but failed to follow through. I absolutely loved Japan and have urged my kids to make the trip in my stead. Anybody else out there who traveled to Japan on the U.S.S. General Breckenridge? Thank God, I got to fly back to the USA when my tour was over. Anybody remember Mstr Sgt Eli Hart? I was his little military brat there 55 to 57. Mrs Swanson was my first grade teacher on base. The first place I set foot on Japanese soil. April 1961. 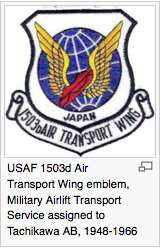 I was stationed at Tachikawa AB from 69-71, 2875th GEEIA squadron later named 1837th EIS. some of the fondest memories of my life. Best group of young men I have ever ran across. Longing to return, we stayed at Yamato air station. While attending the Los Angeles Pen Show last weekend (yes, there are really very large gatherings of pen collectors throughout the country), I came upon a classic collectible fountain pen which I purchased because it is something I collect and deal in. It has the inscription “James S Garrison Sunday School Superintendent Tachikawa Air Base Japan 1961 – 1964”. Was this your father? And does anyone have an interest in this pen? I’m about to restore the pen which would involve removing the inscription, but if it is significant to you because of your relation to the person whose name is on it, I don’t want to destroy its value as a cultural artifact to you. By the way, the model of the pen is “Pen For Men (PFM), made by Sheaffer. It is a large, manly pen, thus the name. My husband, Bob Klose, and I arrived at Tachi on New Year’s eve in 1955 with our 6 month old son. We were one of the first families to travel concurrently, and were the only enlisted family on the luxury ship President Cleveland on its Christmas Cruise to the orient. Also on that cruise were John Wayne’s parents and the family priest. We did get to see John Wayne as we passed him on a staircase. He worked in NAMAP headquarters in War Plans. We lived in the Green Heights compound a few miles from the base. I laugh when I remember being VERY pregnant and catching a ride with a Japanese man on his three wheeler to go to the base grocery shopping. My daughter was born at the base hospital in June of 1956. We then lived in the humungous Green Park apartments, which I believe had been, (correct me if I’m wrong) a factory turning out Mitsubishi aircraft. It had everything including movie theater, chapel, etc. We moved from there to half a Quonset hut, 2759B, on base near the big building with the movie theater and across the street from the BOQ. I worked at first in Supply as clerk in the classified cage and then at the Base Hospital in Records under a Lieutenant Mann. 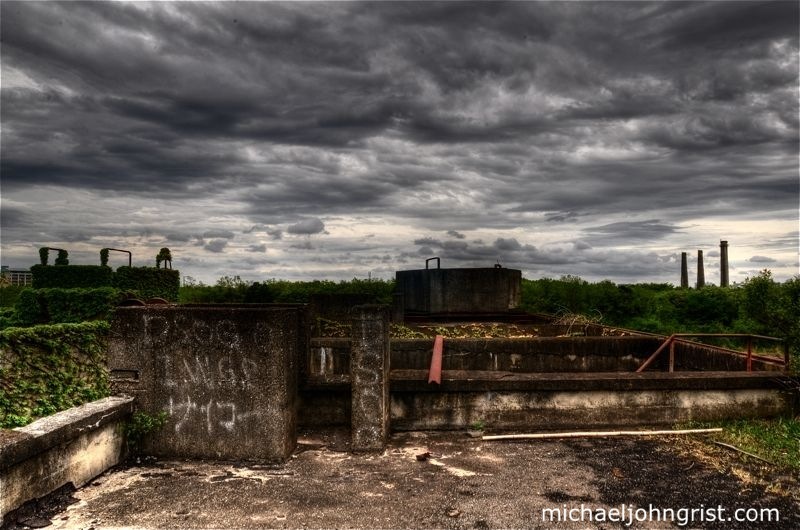 I have many happy memories of Tachi and have enjoyed seeing the pictures of the now-derelict base and reading the comments from other readers. We left Tachi in 1959 on the heels of a typhoon which did much damage to the base. We were glad we had already passed our cleaning inspection, for the wind blew off a window or two and deposited much mud on the carpets! We had had friends who lived off base come and stay with us to be safe, and their place in the paddies got no damage at all! I remember watching an old papasan riding his bike down the street with a sheet of corrugated metal chasing close behind him…he turned left at our corner and the metal went straight on! Our trip back stateside was not as luxurious as the President Cleveland but still a good memory on the USS Gen. Mann. So glad I found your site….thank you! My father Ken Whitehouse was stationed at Fuchi 68-71. There was no hospital at Fuchi so I was born at Tachikawa. I have no memories of my time there but would love to go back some day! This group is for anyone that was stationed at “Tachi” in the U.S. Military, Civilian Workers, Japanese employees and Military Dependents. Join the Tachi group and check out the 10,000 photos and thousands of messages that have been posted. We have a lot of fun on this site and would love to have you come aboard to share all the fun times and special moments you had there. Do you have a favorite memory of Tachi you would like to share, then this is the place for you. Please keep your post to your time at Tachi AB or living in Japan.